Since it's release in May, House of Cards has had an incredible run. Along with holding the #1 spot in the Dutch iTunes charts for its second consecutive week, the song has officially entered the Dutch Dance Charts at #9, making it the most sold single of the last three weeks. To add to the ever-growing excitement, the House of Cards music video debuted on XITE Television's "Daily Noise" as the featured song for their "Retweet the Beat" segment. "Retweet the beat" is segment that airs on the popular International Music Television Channel, XITE. It gives up and coming artists a chance to have their music videos shown on their afternoon show "The Daily Noise". The network selects a music video to feature, and then posts their selection onto twitter. In order for the song to air, the post must be retweeted 30 times by fans across the country. House of Cards blasted by this requirement, receiving 64 retweets from fans all over the world! The song made its television debut on Thursday, June 5th; airing in The Netherlands, as well as Belgium! 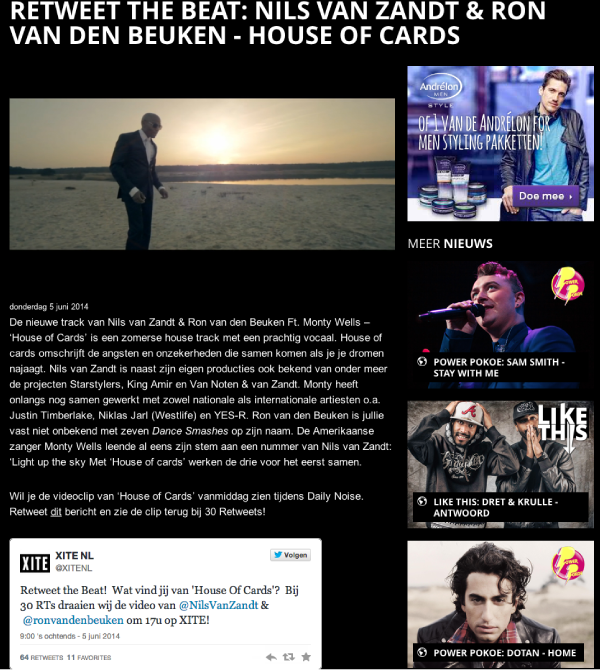 Monty Wells To Appear on 538 Hitzone 70!House of Cards" is #1 on iTunes Dance Charts!! !